Not another zoo for Chai and Bamboo. That's what elephant advocates, including Bob Barker, are saying after Seattle's Woodland Park Zoo (WPZ) announced their decision to send their two surviving elephants to yet another zoo instead of a sanctuary. The WPZ's shocking announcement on Feb. 27 that the long-suffering elephants would go to the Oklahoma City Zoo (OCZ) - while rejecting either of the two sanctuaries that have offered permanent homes to Chai and Bamboo - has advocates appalled and rallying to change that decision. Elephant advocates led by Seattle's Friends of the Woodland Park Zoo Elephants have campaigned for a decade to close the WPZ's elephant exhibit and transfer the elephants to one of two natural-habitat US sanctuaries, Performing Animal Welfare Society (PAWS) in California or The Elephant Sanctuary (TES) in Tennessee. Other animal rights organizations, celebrities, and the Seattle Times newspaper lent support. 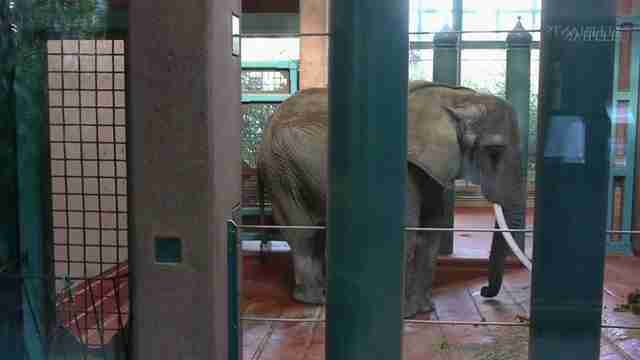 Elephant experts and the WPZ's former zoo director also weighed in. Following the sudden and premature death of African elephant Watoto at only 45-years old last August, the WPZ finally agreed to close its elephant exhibit and re-home Chai and Bamboo. In January, Seattle's mayor and five of its city councilors urged the WPZ to consider a sanctuary. The clarion call from advocates and Seattle residents rang clearly: send Chai and Bamboo to live out their lives in peace at a sanctuary. Elephants evolved to walk long distances - many miles a day in the wild. Their bodies need exercise to stay physically and mentally healthy. Like Watoto, Chai and Bamboo both suffer from arthritis and foot disease, the leading causes of premature death in captive elephants, due to their decades in the one-acre enclosure at WPZ. Their new exhibit at the OCZ, where they'll join five other elephants on a divided three-plus acres of space, actually reduces the amount of space per elephant to less than what Chai and Bamboo have now in Seattle. Their presence will also crowd the OCZ's five elephants further as this Google satellite view shows. 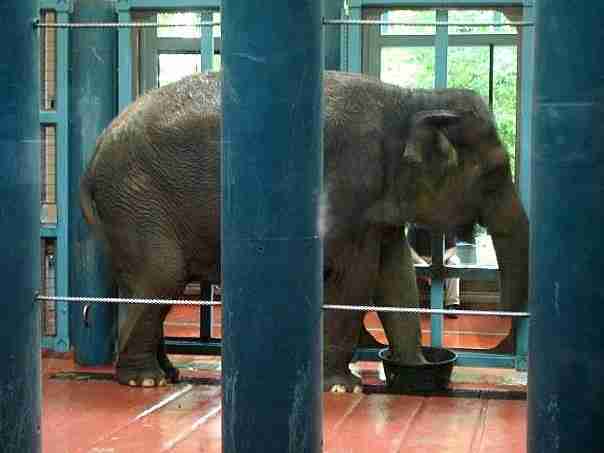 Compromised welfare, including lack of space, results in neurotic, stereotypical behavior in elephants housed in zoos. Chai, seen in the video below, has engaged in stereotypy (meaningless, repetitive behavior), which is the mind's way of coping with trauma, stress and crushing boredom. The WPZ stated its intent to transfer Chai and Bamboo to "a healthy environment free of active infectious disease." The WPZ dismissed an offer from the PAWS sanctuary claiming that there is tuberculosis (TB) there, despite an offer by PAWS' co-founder Ed Stewart to build a new Asian barn and 15 to 20 acre habitat for Chai and Bamboo. 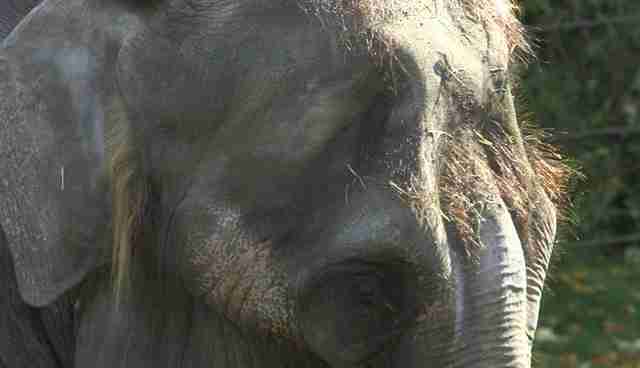 But bull elephant Rex at OCZ tested positive for antibodies to tuberculosis on a Stat-Pak serum test in December 2011. 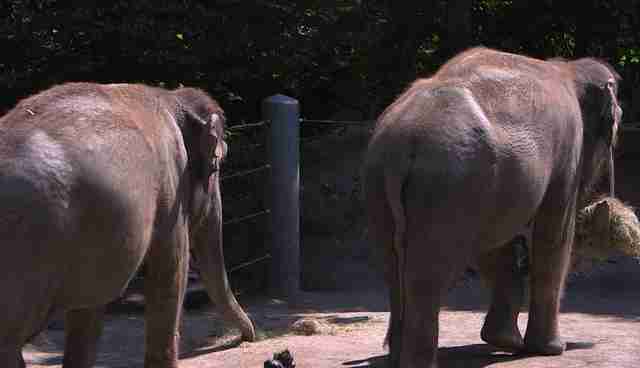 Asha and Chandra, the OCZ's two adult female elephants, came from Dickerson Park Zoo where elephants have also tested positive for TB antibodies. 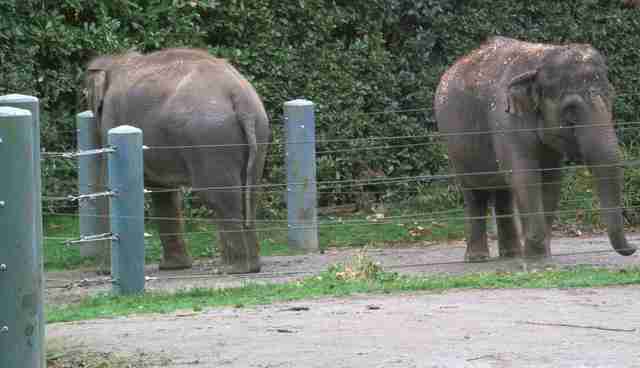 The OCZ does not have the space for quarantining elephants should Rex, or any other elephant, develop the disease. PAWS and TES both have ample space. So the OCZ certainly does not meet the WPZ's stated requirement of being free of disease. The US Centers for Disease Control (CDC) conservatively estimates that 12 percent of U.S. elephants are infected with TB. That includes many zoos accredited by the Association of Zoos and Aquariums. Just three hours south of Seattle, the Oregon Zoo in Portland is currently treating three of its elephants with TB medications. The greatest threat to Chai and Bamboo's health is their pre-existing arthritis and foot disease, which placement in a sanctuary will improve or keep from deteriorating further. The OCZ continues with irresponsible breeding despite the clear risk of calves dying from the deadly EEHV (Elephant endotheliotropic herpesvirus), and may try to breed Chai. Chai suffered 112 highly invasive artificial insemination procedures in Seattle. She lost her calf Hansa to EEHV; she died an excruciating death of internal hemorrhaging in a pool of diarrhea. Chandra and Asha have also been exposed to the deadly EEHV, especially fatal to young Asian elephants, which could affect any new baby elephants born at OCZ. This graphic video reveals the OCZ's archaic and barbaric birthing process during Asha's delivery in December, which involved chaining Asha by two legs and use of an electric prod called a "Hot-Shot." Rex's TB positive test result and the presence of EEHV in the OCZ herd, and possibly Chai, should prohibit any breeding plans for Chai and shows OCZ's irresponsibility in their quest for calves. U.S. sanctuaries don't breed elephants. Oklahoma City has colder winters and hotter summers than Seattle, and is prone to especially frequent and severe tornadoes. Weather data shows that Oklahoma City experiences snow for four months in winter. As of March 4, the zoo had been closed due to weather for about seven of the previous 11 days. "If it is freezing, the elephants stay in the barn," said Laura Bottaro, the OCZ's animal curator at the Feb. 27 press conference. In fact, the zoo says the elephants stay in unless it's topping 55 degrees out. While remaining indoors may protect elephants from cold temperatures, it comes at a deadly cost: arthritis, foot disease and tedium. The OCZ makes the elephants perform unnatural circus-style tricks for audiences as seen in this video. They are forced to balance a foot on red balls and pedestals, or do a trunk curl "salute" for spectators, behaviors not displayed by elephants in the wild. At both sanctuaries, elephants live as closely to the wild as possible and are allowed to "just be elephants" with no tricks or performances. The WPZ emphasizes a social "herd" at OCZ but the odds of successful integration are slim. Unlike sanctuaries, few zoos have space for proper introductions of unrelated elephants. OCZ is no exception, with its biggest exhibit area being 2.6 acres. Nor do Bamboo and Chai have a record of positive interactions with other elephants. Bamboo is not likely "auntie" material to the OCZ's young calves Malee and Achara. 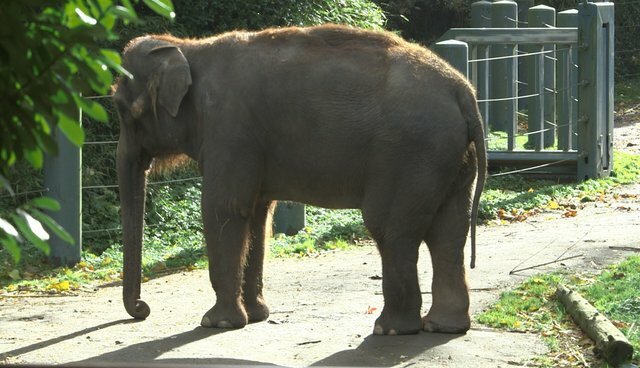 In 2006, the WPZ sent Bamboo to the Point Defiance Zoo in Tacoma, WA to safeguard Chai's young daughter Hansa from reportedly being swatted by Bamboo and because she was incompatible with Watoto. 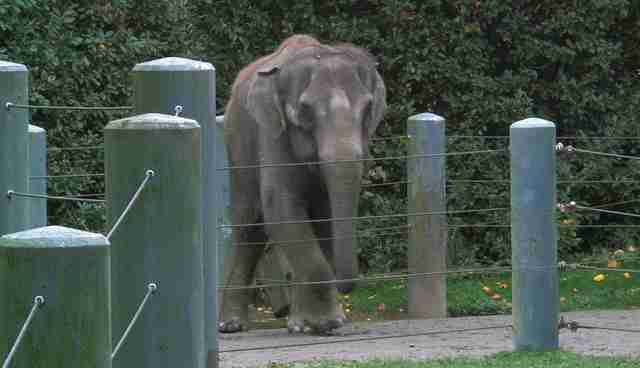 The zoo failed to integrate Bamboo with the elephants in Tacoma and she was sent back to WPZ within a year. If Chai and/or Bamboo don't bond with the OCZ's elephants, then one or more elephants will be confined to one of the half-acre enclosures - or would be sent off to an even worse zoo. There is certainly precedent for zoos being unable to integrate herds: almost a year after the Calgary Zoo's three female elephants moved to the National Zoo, they're still kept separate from the four other Asian elephants there, with whom they were expected to form a multi-generational herd. The OCZ's amphitheater, which accommodates 6,000 people, is in close proximity to their elephant enclosure as viewed here. Elephants not only have excellent hearing, they communicate over long distances by seismic communication and are sensitive to vibrations. It would be stressful to Chai and Bamboo to be exposed to loud, sustained rock music at the OCZ. 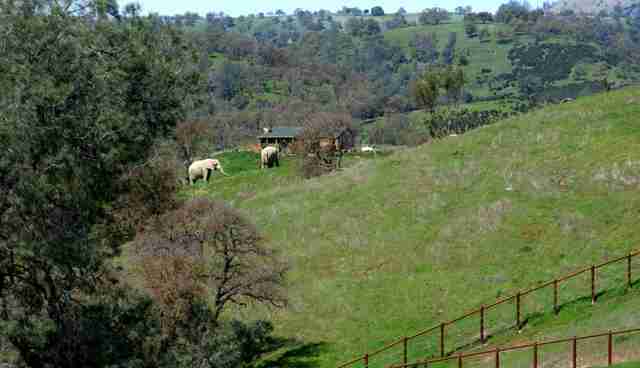 In contrast, life is quiet, serene and peaceful at both TES and the PAWS sanctuary. It's impossible to grasp or appreciate the complexity of elephants' intelligence or natural lives in a zoo setting. Continued zoo captivity, which is focused more on the voyeuristic pleasure of human visitors than on meeting the social and physical needs of elephants, is not a humane or responsible choice for Chai and Bamboo. They've served the public most of their lives, have their own inherent worth and interests independent of any human want or need, and a progressive city like Seattle should insist on putting the needs of these long-suffering elephants first. It is for those reasons that the only ethical choice is for Seattle to send Chai and Bamboo to one of the two sanctuaries that have offered them a lifelong home at no expense to the City of Seattle or their taxpayers. If you are near Seattle and want to help Chai and Bamboo, please attend the press conference at 1 p.m. followed by the Seattle City Council meeting at 2 p.m. on Monday, March 9 at Seattle's city hall. Wear orange to show your support for sending them to a sanctuary. Residents in Seattle and those elsewhere, please call Seattle's Mayor Murray at 206-684-4000 and Councilmember Sally Bagshaw at 206-684-8801 to politely ask them to intervene and exercise the city's legal authority to change Chai and Bamboo's future to a sanctuary, not another zoo. 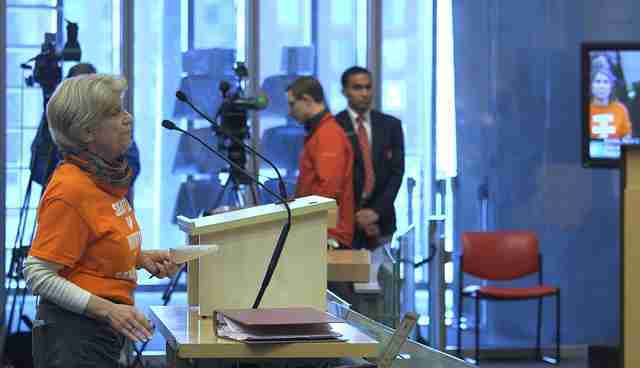 The Mayor and City Council has the authority and ability to ensure a better future for Seattle's elephants. Please also sign this petition for Chai and Bamboo. 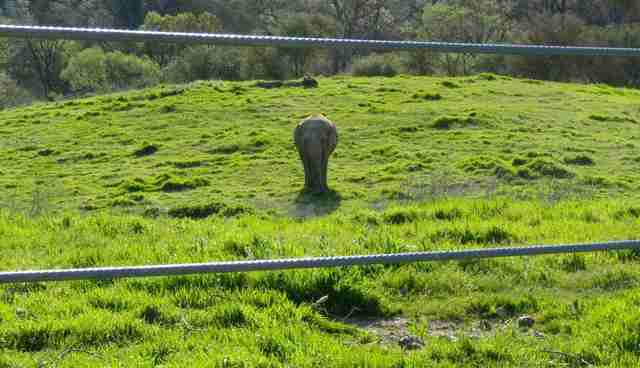 For more information, please visit Friends of Woodland Park Zoo Elephants on Facebook or their website.